A lock with a future to match his tremendous height. Gilchrist’s impressive form for Edinburgh, particularly in their 2012 Heineken Cup campaign, saw him selected in Scotland’s 2012 Autumn international campaign. Gilchrist has represented Scotland at U-18, U-19 and U-21 levels. Gilchrist was part of Scotland’s IRB World Championship team of 2010. Gilchrist was the recipient of the prestigious John McPhail scholarship and spent months playing in Christchurch, New Zealand for the Lincoln University. In August 2016, he was named co-captain of Edinburgh Rugby, along side team mate, Stuart McInally for the 2016/17 season. 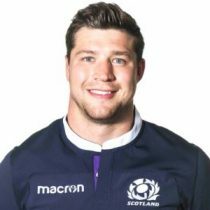 In April 2017, Scotland second-row Grant Gilchrist has extended his stint with Edinburgh after signing a new two-year contract. Gilchrist, who was named as club co-captain ahead of the current season, will don the black and red until at least May 2019. The 18-times capped internationalist joined the club on an academy contract ahead of the 2010/11 season and – after a period in New Zealand as a recipient of the coveted John MacPhail scholarship – made his Edinburgh debut against Cardiff Blues the following term. He went on to make 26 appearances in his first season and has now represented the club on over 95 occasions. In January 2018, he was named in Scotland's squad to compete at the 2018 Six Nations tournament, where he'll look to add to his currect 18 caps. As of the 2018/2019 Champions Cup, Gilchrist has had 32 European Cups appearances. Ahead of the 2019 Six Nations, Gilchrist has 28 test caps.